I have to admit that if a book has the word PARIS in the title, I am going to read it. Sometimes I get a good book and sometimes not. This time I was thrilled because this is a fantastic book. 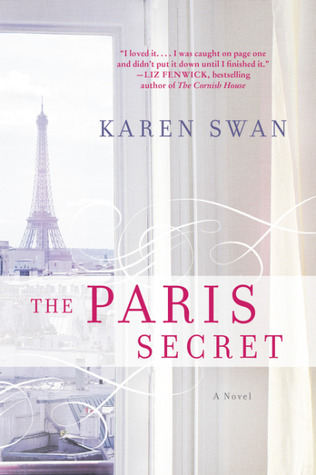 I have never read anything else by Karen Swan but I plan to read her previous books. interesting characters - the main character Flora as well as all of the supporting characters. I especially enjoyed Flora's best friend Ines. mystery - how and why were all of those paintings hidden in an apartment in Paris for over 50 years. Flora is a high powered fine art agent and is thrilled to be asked to look at a recently discovered abandoned apartment in Paris. Underneath all of the dust and debris and hundreds of paintings and sculptures, Flora found a missing Renoir that had been lost for years. While trying to trace the painting's past purchasers, she found out information that could ruin the lives of the glamorous heirs of the apartment. What she does with that information makes this a thrilling and interesting book. This book is so much fun to read. It's full of the beauty of Paris, the beautiful clothes and a whole group of very interesting characters. Parts of the book take place during WWII but the main focus is on the modern day mystery of the Renoir painting. I found this a book that was impossible to put down once I started reading it.